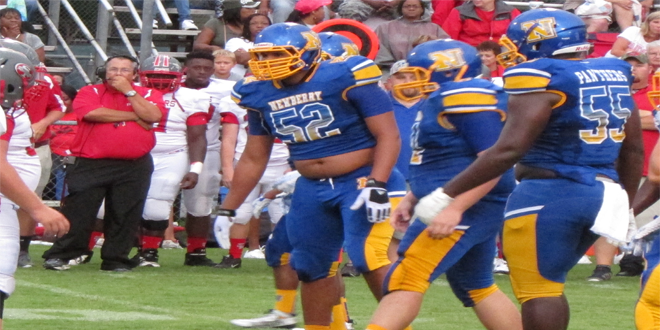 Cory Durden on the right in blue & gold for Newberry. (All photos by Mike Capshaw). For all the schools never to produce a single major college football player, consider this: Newberry High, a Class 1A team, has three reporting multiple FBS scholarship offers. All three project to play on the defensive line. Newberry, a shovel pass west of Gainesville off I-75, is home to tasty BBQ and an annual Watermelon Festival, among others things. The cousins and college recruits – Cory Durden, Malik Neal and Ja’len Parks – will vouch for the BBQ, but also say to try the seafood. More importantly, they say watch out for the 2-1 Panthers heading into Friday’s 1A District 7 opener against Williston. They opened 2015 by upending 4A Santa Fe (21-12) and 5A Gainesville Eastside (34-14) before falling 39-13 at perennial 1A power Union County. Durden and Parks, who say “we’re cousins, but we’re more like brothers,” are dominating defensive tackles with amazing quickness and size, especially considering they’re only juniors. They also rotated at left tackle in the first two games (see video) to stay fresh for defense, but NHS third-year coach Kepa Sarduy plans to line them up at both offensive tackle spots for district play. 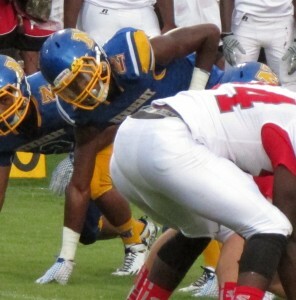 Jalen Parks for the Newberry Panthers. “They’re ready for college now,” Sarduy said. “But college will have to wait because I get them for two more years. Parks (6-foot-4, 280 pounds) is verbally committed to Florida State, but like with most pledges these days, it’s essentially a placeholder. Besides, there’s plenty of time between now and Feb. 1, 2017, which is when the national signing period begins for Parks’ class. So what would it take to change Parks’ pledge to FSU? 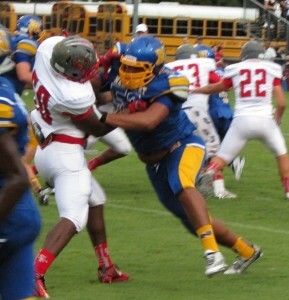 Newberry’s Malik Neal going up against Santa Fe in Week 1. Parks and Durden (6-4, 293) have dreamed of playing college together and, with the Seminoles among several schools to extend both scholarships, that dream may become a reality. Despite offers from Florida, Miami, NC State and Oklahoma, among others, it sounds like Newberry’s DT duo is Florida State’s to lose. Durden said several family members attended FSU, but he doesn’t expect another relative, Malik Neal (6-4, 210), to head to Tallahassee for college. 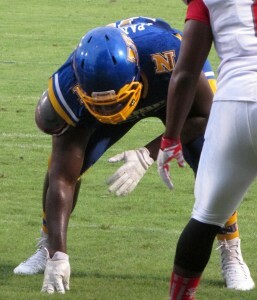 Neal hasn’t been offered by the ‘Noles, but he has plenty of top colleges to choose from with offers from Colorado, Oregon State, South Florida, Troy, Utah and Western Kentucky. The Class of 2016 prospect with an explosive first step also receiving interest from Louisville and Missouri, among others. While the defensive-line-playing cousins share plenty of similarities, they have contrasting personalities. Parks is the strong, silent type. Durden is a rah-rah guy on the field and jokester off of it. Neal is a little of both, but also is kind of a deep thinker who plans to major in Psychology. Neal also spits rhymes as a freestyle rapper when a group of Panthers players circle up in the gym “to stay loose and crack jokes” before games. The one thing all three can agree on is that Newberry is a special place with special people. That’s been a major motivating factor in starting the season 2-0 after posting a 5-5 mark and missing the playoffs last season.